It can be tough to keep a cool head these days, especially if you don't have a cool roof. What's a Cool Roof? A cool roof relects and emits the sun's heat back into the sky instead of sending it down into your home or office. Living in the desert Southwest we certainly know that the sun is a powerful source of light and heat. Yet strangely, the most common roofs around here are flat and covered with black tar and gravel. Choosing a cool roofing material can make a large difference in your heating and cooling bills and your year-round comfort level. After a lot of saving and even more research we had the roof on our home replaced. The old, asphalt shingle roof was worn-out and in desperate need of replacement. We chose a Galvalume finish metal (a.k.a. 'Pro-Panel') for our pitched roof, which is a common material in Northern New Mexico, long-lasting and it's even Energy Star rated. The roofers installed a ridge vent on the roof and I cleared out the eave vents and installed air chutes (insulation trays) to improve ventilation. According to the Florida Solar Energy Center the old 'Autumn Brown' asphalt shingles on our roof had a Solar Reflectance of 9.6% and Infrared Emittance of 91%. The new 'Galvalume' metal roof has a Solar Reflectance of 60.9% and Infrared Emittance of 25%. (As the metal roof manufacturer's numbers were only slightly different I used the FSEC ratings for both roof materials for consistency). Very simply, the asphalt shingles were great at both absorbing solar energy and radiating heat while the metal roof is MUCH more reflective but not as effective a radiator. Since it is fall I don't know yet how much cooler this roof will keep the house. But, there are online calculators that can give me an estimate. The DOE Cool Roof Calculator (for flat roofs) estimates that we will save $.068/sq. ft. on cooling and $.043/sq. ft. on heating for a Net savings of $0.111/sq. ft. year round. If the calculator is accurate we could save about $122 per year from the new roof. I think our actual savings will be a bit better despite the fact that we don't have air conditioning or a swamp cooler (evaporative cooler). First, our roof is pitched which reflects solar heat better than a flat roof. Secondly, the ridge and eave vents will help cool the roof by convection (i.e. hot air venting outside the attic). Finally, we will be insulating the heck out of the attic very soon (more news to follow). While I love the winter I'm already thinking about next summer. I think our little home will be one of the coolest on the block, thanks to our cool, new roof. It will be a refreshing refuge on the suburban heat island. Submitted by Jaya on Tue, 2010/07/13 - 12:14pm. 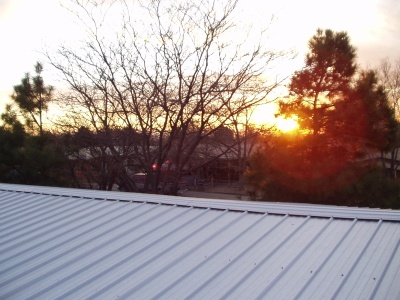 I enjoyed your article, and am now even more pleased that I'm getting a new Pro Panel roof installed, to replace the old shingle roof, on the house I'm purchasing in northern New Mexico. I knew Pro Panel roofs looked great and lasted for ages, but I hadn't known about it also being a 'cool roof' until I read this article. Don't forget to vent the roof! Submitted by TimJFowler on Thu, 2010/07/15 - 2:00pm. Be sure to read the brochure for the metal roof panels you choose - some colors are much "cooler" than others. When you get your new roof installed don't forget to make sure that it is well vented. Clear out the eave (soffit) vents (or add them if you don't have any) and have ridge vents or other roof-top vents installed. That ventilation ensures that the heat that does build up in your attic can escape. Once the roof is ventilated you should check how well the attic is insulated. We upgraded our attic insulation which made a big difference in our heating bills - Heating Bill Before and After Insulation.